The ear is an organ that reaches its full size early in life. As children develop their body image, they become aware of their protruding ears and if they are ever teased about it, they rarely forget it. Surgery is frequently done on children, but there are a large number of young adults and older adults that request correction. When looking at the protruding ear, there are three features to evaluate. 1. Proper folding of the ear cartilage. 2. Cupping of the ear. 3. The amount of separation of the ear from the skull. Based on the analysis, a correction will be planned. The recommendation for correcting protruding ears is that it is done before the child starts school. It is not recommended that it be done before the age of 5 as the ears are still growing. Evaluation of the deformity will determine if simply creating the missing cartilage fold will provide the needed correction or if additional surgical maneuvers such as cartilage resection or suturing the ear to the skull will be required. For many of our patients Dr. Makhlouf is able to do the procedure under local anesthesia in the office. 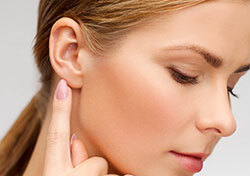 The procedure is painless and will take 45 minutes for each ear. The incisions are made in the posterior aspect of the ear so they are invisible. Postoperative care is very minimal, two days after the surgery the bandages are removed and the ears are exposed. The only request is that for 2 months after surgery, the patient wears some type of bandanna during sleep, in order to protect the ears. The results of this procedure are visible immediately. The ears may remain sensitive for a couple of months but this will not result in any significant amount of pain. If you are ready for a consultation, then give us a call at 847.297.8001. In the meantime, please check out our patients’ before and after pictures in our photo gallery. My mission as a cosmetic surgeon, aesthetic surgeon or plastic surgeon in Chicago is to mold your body and face as harmoniously as possible. To achieve this goal, I will provide personalized advice and guide you to obtain the desired result. Many of my patients are my own colleagues, who in turn have referred me to their families and friends in the Chicago area and suburbs.